Yesterday was Groundhog Day and by some accounts across the country, he didn't see his shadow! Which means, Spring is supposed to be around the corner. In addition to the folklore, for us it was also the day to bring our broodmares in. 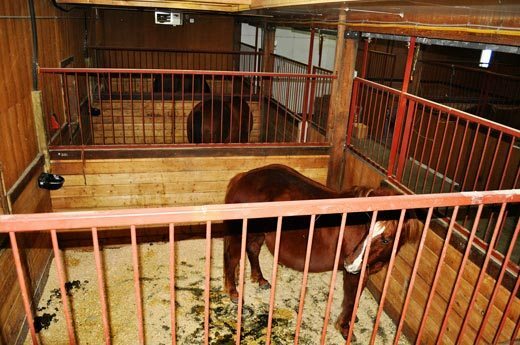 With some early spring foaling dates, we like our mares to have at least a month or more of being inside the barn at night so they can get used to the surroundings where we hope they will foal. We find there are many benefits in regards to the health and well-being of our broodmare band in doing so. Giving the mares at least a month's leeway gives them a chance to acclimatize to a warm barn (versus the outdoors) and we can get them used to straw bedding at approximately 2 weeks prior to their due date. Also, bringing them in from the pasture every night allows us to take a good look at each mare and see how the pregnancy is progressing. And finally, putting them into the stalls of our foaling barn every night helps them build up antibodies in their colostrum for the foal's new surroundings. On the contrary, bringing them inside with less than a month before the estimated due date, or even at their due date, only serves to stress the mothers-to-be out. 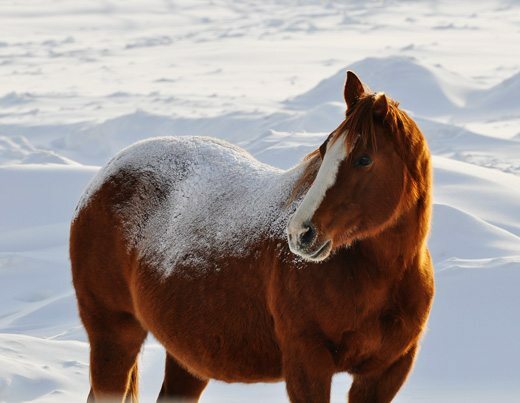 And with expected due dates of early March, leaving them outside to foal is out of the question since March temperatures can be bitterly cold here in Regina, SK. So for the next few days on My Stable Life let's talk about some other important considerations to keep in mind, in preparation for foaling. • All pregnant mares must have body condition scores (BCS) of 5 or greater. This is because maintaining pregnancy becomes very difficult when the BCS of mares drops below this level. 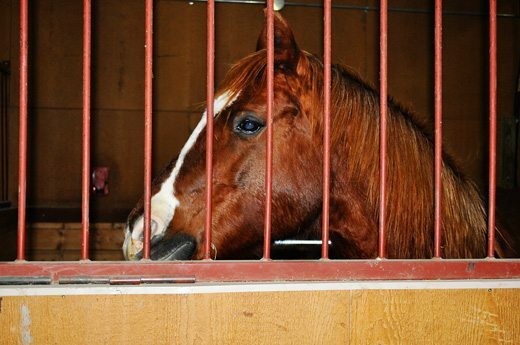 • A body condition score of 5 is defined as “moderate” in the equine BCS scale. It is described as a mare that has a level back and her ribs cannot be visually distinguished, but can be easily felt. The wither appears rounded over the spinal vertebrae and the shoulders and neck blend smoothly into the mare's body. Also, fat around the tailhead feels spongy. • The mare should foal at a BCS of 6 or greater and this degree of body fat needs to be established during the first 8 months of pregnancy, since digestive capacity of considerably reduced during the last trimester. • Lactating mares, on the other hand, must also have body condition scores of 6. Since it is still very difficult for mares to gain weight while nursing, this body condition should have been established long before the foal is born. Mares will also experience a small to moderate weight loss once the foal is born and nursing – and the mare can only eat so much to maintain herself, plus ensure she has the energy for lactation. It is not possible for her to also eat during this time so that she actually gains weight. • A body condition score of 6 is defined as “moderate to fleshy.” It is described as a mare that has a slight ridge along her back. The fat over her ribs feels spongy and fat around the tail head feels soft. Fat packets are also deposited (and can be felt) along the sides of her withers, behind the shoulders and along the sides of her neck. Ensure your broodmare is prepared for foaling by first ensuring she has the right body condition score. Tomorrow, MSL will focus on broodmare nutrition throughout various stages of pregnancy, plus other things you can do to ensure your foal has the best start in life! Like the new look. I were pleased with this article. Thanks a lot for a brilliant write.